While in the Ferry building, we shared a little meal along with some of the bread. DELICA rf-1 offers japanese style fast food. 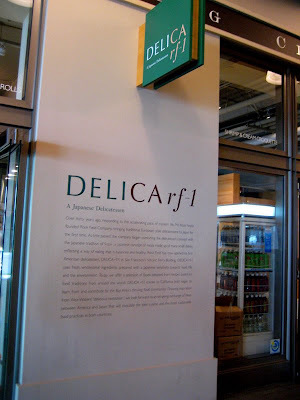 They call themselves a japanese deli. Some of the day’s options. 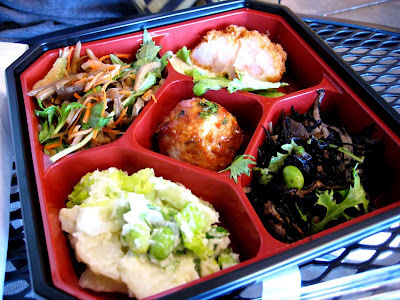 We picked up this little bento box to go, and it was filled with 5 different things. 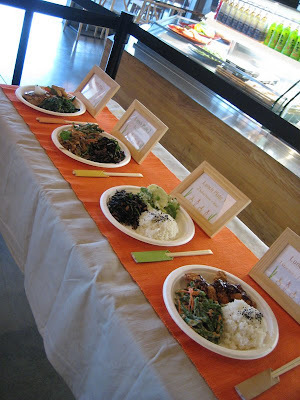 Three vegan salad options: Hijiki and Soybean Salad (with seaweed mixed with dried soybeans, edamame, konnyaku, daikon, wild mizuna, fried tofu, and kuko), Wasabi Garlic Potato Salad, and Spicy Burdock Root Salad (with braised burdock and konnyaku tossed with thin slices of white onion, celery, julienne carrots, and wild mizuna). And 2 fried meat options: Fried Shrimp Cake and Sweet & Spicy Chicken. All of these were delicious. The salads were especially good, even for being completely vegan!